Citizen Potawatomi Nation has several tribal enterprises that provide services to our citizens and create a substantial economic impact in our communities. Our businesses further the success and prosperity of the Nation by providing employment opportunities for tribal citizens and revenue to support tribal operations. Our enterprises provide the economic foundation to diversify and expand our current business operations and provide for expanded economic growth in our communities. With more than 2,200 employees, Citizen Potawatomi Nation operates a variety of tribal enterprises including First National Bank, Grand Casino Hotel & Resort Resort, FireLake Discount Foods and the Community Development Corporation. Citizen Potawatomi Nation owns and operates the largest tribally owned grocery store in the United States. Our enterprises provide services to our citizens and create a substantial economic impact in our communities. Our businesses further the success and prosperity of the Nation while providing employment opportunities for tribal citizens and revenue to support tribal operations. Citizen Potawatomi Nation operates two casinos, along with multiple entertainment venues, retail shops, fuel and convenience stores, golf courses, museums and hotels. Visit one of our entertainment destinations for an evening out or a day of family fun. 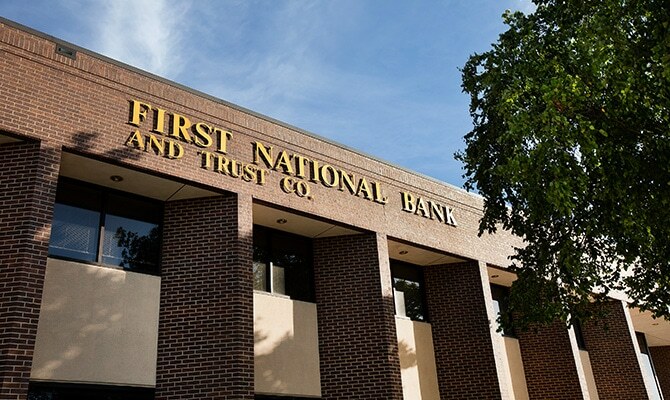 First National Bank & Trust Co. is the largest tribally owned national bank in the United States. FNB has branches at Citizen Potawatomi Nation Tribal Headquarters and in Shawnee, Holdenville, Granite, Mangum and two in Lawton, Oklahoma.